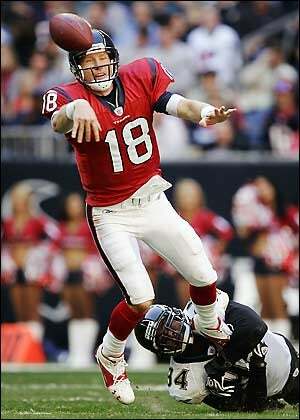 Miami 14, Houston 3 Matt Schaub started off with game with 2 interceptions, showing Sage Rosenfels that if anyone is going to be turning over the ball in a Houston uniform, it's going to be him. Meanwhile, Chad Pennington went bomb crazy to Patrick Cobbs, connecting for 53-yard and 80-yard TDs. St. Louis 3, Washington 7 Stephen Jackson started off the game by gift-wrapping a Redskins TD, fumbling it at the 3. A Clinton Portis rush later, and it's a 7-0 game. The Rams pretend they're an actual NFL team by scoring a few points. Chicago 0, Atlanta 6 The Bears have kept Michael Turner at bay, but rookie Matt Ryan looked like a 10-year veteran, converting every 3rd down in sight. Detroit 0, Minnesota 2 Haha. Someone's got to win this game. Might as well be because Dan Orlovsky forgot where he was on the field and accidentally ran out of the end zone. Somewhere, Matt Millen laughs. Baltimore 0, Indianapolis 14 Peyton Manning decided to start playing like himself, starting with a 67-yard bomb to Marvin "Don't call me Marv or I'll shoot you" Harrison. That was followed up with a 22-yard strike to Reggie Wayne. The Ravens' much-ballyhooed defense does not look so ballyhooed. Carolina 0, Tampa Bay 14 The Flying Grudens get nuts a little early with a punt block returned for a TD. Jeff Garcia followed that up with a strike to Alex Smith, causing Brian Griese to wonder if he's going to get the starting job when he comes back from injury. The Magic 8 Ball says "Outlook Not So Good". Oakland 3, New Orleans 7 Janikowski wakes up, takes a shot of vodka, kicks a field goal, goes back to sleep. The Saints answer with an extremely boring 18-play, 11-minute drive finished up by a Reggie Bush TD. Cincinnati 7, NY Jets 10 Brett Favre started the game by playing like Brett Favre, by which I mean, turning over the ball to the tune of a Bengals defensive TD. He then went on to play like Brett Favre, by which I mean, a TD pass to Thomas Jones.